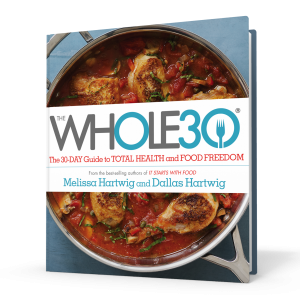 The Whole 30 first came out in 2009 when sports nutritionist Melissa Hartwig, blogged about a 30-day dietary experiment she had just completed, and her blog went viral. Since then, millions of people have been trying it, and raving about it. The Whole 30 is essentially an elimination diet, meaning that certain categories of food that are believed to have a negative impact on the body are eliminated, or removed, from the diet for a certain period of time, in this case 30 days. The idea is that by doing this you allow your body to “reset” and recover from the impacts that these foods have been having on you, and after the 30 days there is a reintroduction period, in which certain categories of foods are reintroduced so that you can see whether or not they have an impact on you, individually. A common misconception is that this diet is intended for weight loss, as you would assume that most diets are, and while most people will experience weight loss in this process, the Whole 30 is more of learning experience to get in touch with whole foods, and learn about how your body responds to certain foods. The Whole 30 is said to be a life-changing experience, so I spoke with our instructors to see what they’re experiences have been. What made you want to try the Whole 30? Christian Z. first did the Whole 30 in 2015, and has recently started a new round of it. He first started because he was in desperate need of a lifestyle change, he wasn’t feeling great in many aspects of his body, and he had seen several friends try it and have great experiences. Sam W. first tried the whole 30 this past Winter, and she tried it because she wanted to change up the way she was eating. The Whole30 emphasizes meals filled with whole nutrient dense foods and she felt that she was snacking more than she should, and choosing foods that were more processed than necessary. Kelly D. hasn’t started her Whole 30 yet, but she just got the books in the mail and she chose to try it after hearing and seeing many her friends have success with it. A lot of her friends felt that it turned into a lifestyle more than just a temporary diet, and she’s interested in something sustainable. Val B. tried it with the hopes of losing weight. Christian thought that the most difficult part would be giving up dairy, but it turned out that week 1 was the hardest for him because he experienced some serious sugar withdrawal. Sam’s most challenging aspect of her experience was socializing, and going out with friends because almost all options at restaurants were not Whole 30-friendly. Val’s biggest challenge was the food prep, and cooking of meals, she thought that she’d be able to food prep and make it easier but that just didn’t happen for her. How did you feel throughout it? After just two weeks of it, Christian was without digestive issues, he had already lost a significant amount of weight, and his skin was even looking better. He really enjoyed this way of living. Sam felt pretty good in the first week, felt tired and bloated in the second week, and felt back to normal for the third and fourth weeks. She did mention that she already had a pretty healthy diet before starting the Whole 30, so going through with it did not involve as much adaptation for her as it may for some people with more typical American diets. Val’s experience was similar to Sam’s, in that she had a pretty healthy diet to begin with so it wasn’t a huge adjustment for her. She did feel a little sluggish in the first few days, but said that it wasn’t too bad and she came back around quickly. How did you feel after it? Christian felt “pretty darn good” after his 30 days, he had eliminated a number of health concerns, and gone down multiple sizes in clothing. He loved it so much he kept up with it for nearly 10 months after the initial 30 days. Val felt “terrific” after the 30 days, she felt she had way more energy than usual. How did you approach the days following your first 30 days? Did you do the reintroduction, go back to the way you were eating before, stick to the Whole 30, etc.? Christian did not follow with the reintroduction but instead just did a less restrictive version of the Whole 30, he allowed certain exceptions on weekends especially. Over the course of the last year he had fallen into more exceptions than not, so he just started another Whole 30 last week, and he said he may even do it for 90 days! Sam didn’t follow with reintroduction phase exactly as it’s recommended but she was mindful about what she was having, and how it made her feel when she did. Again, because she ate pretty well before starting, the transition out of Whole 30 wasn’t very significant. Val didn’t go through the reintroduction phase, but she also didn’t just go back to normal either. She is still avoiding dairy and gluten almost entirely, and she is still feeling really good about the way she feels eating more whole foods. What was your biggest takeaway / what did you learn about yourself, or body in the process? Christian felt that the whole process put him back in touch with food, and cooking from scratch, which reminded him of growing up in Germany where they raised their own meat, and grew their fruits and veggies. He said it was like a journey back in time. He also realized that eating more healthfully was not as expensive as people so often make it out to be, they spent so much less money ordering out, because they were making things at home. Sam felt that it made her more conscious of the foods she was choosing to put into her body. She learned to eat larger meals instead of snacking as much, and when she did snack she snacked on things she had prepped herself out of whole foods. She did want to mention that she doesn’t feel it’s sustainable on the long term, so people who are pursuing it strictly for weight loss purposes may be disappointed. She still thinks it was a valuable experience that helped her feel more connected with her body. Val’s biggest takeaway was that she incorporated so many more whole foods into her diet, with fewer ingredients and she felt great, and so energized. The experiences of our team echo the experiences of many of the people who have tried it, improved energy, a reconnection to food and cooking, and a deeper understanding of dietary choices and the way it feels to eat whole foods. It certainly sounds like something worth trying but it’s important to do it right, be informed about it, and be aware that it’s not meant to be a quick-fix weight loss solution. The Whole 30 is meant to help people get back in touch with eating real food, and listening to their body. It wouldn’t be a bad idea to speak with your doctor, or another health professional before attempting the Whole 30, especially if your existing diet is drastically different than what the Whole 30 will ask of you. To get the full run down on the Whole 30, how it works, what foods it eliminates, and more, our instructors recommend the Whole 30 30-day guide book, and the website itself is full of information.